“Ora d'Aria”, or "Hour of Air", refers to the hour each day that inmates were given to exercise outdoors while 'guests' at the prison opposite our restaurant's first location. 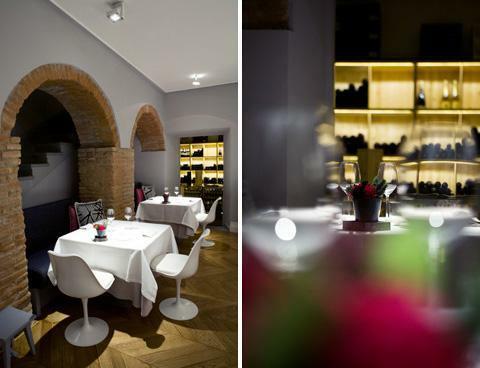 It now refers to time spent here by you, where we give our all to ensure a unique mix of tradition, innovation and elegance created by one of Italy's leading chefs and his passionate team (whose last major accolade was the appointment of a much-awaited and coveted Michelin star in December 2011). We trust in the "passaparola", or word of mouth, from the people that matter most - our diners and, in turn, friends. Indeed we have spent precisely nothing on advertising since opening. With this in mind our international reviews, some of which can be found on this site, are particularly special to us as they show just how far word of mouth alone can travel in a relatively short time. Our aim is simple - to combine the integrity, depth and quality of Italian cooking with a belief in its continuous evolution. We believe that the key to standing the test of time is to never stand still. Furthermore, the historic context provided by our extraordinary city perhaps offers us an almost unique gift - the opportunity to remain young at heart for years to come.